Erica Weiner, the Brooklyn-based purveyor of antique wedding rings, is having an online sample sale. Take a few moments to breathe into a paper bag before exploring this veritable treasure trove of twee. The Nike Free Viritous debuted in March and, shucks, it sure is a beauty. It boasts a heel cage and free midsole, while its flexible silhouette is punctuated by a breathable synthetic upper. Translated: It’s the thoroughbred of running shoes. If Ross Geller taught us one thing, let it be that leather pants aren’t for the faint of heart. Rather, leather pants—unforgiving and torturously sweaty—are a rite of passage. With shredded denim panels and stretch leather, RtA’s skinny pants are the genuine article. And if the price frightens, do remember that they’re marked down from $995. Women who don’t fit in a teeny-tiny size can find a similar version here. 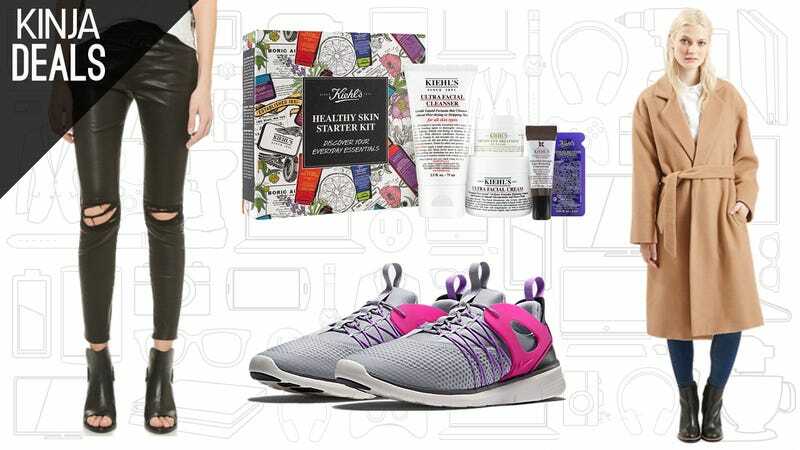 For those in search of perennially flawless skin, your prayers have been answered: Kiehl’s Healthy Skin Starter Kit is only $47, a far cry from its $73 value. This coat flaunts a nearly perfect ‘70s silhouette, leaves ample room for layering, and that price, dear god, that price. But don’t get too attached to it. This polyester coat is the spawn of a fast fashion power couple, Nordstorm and Topshop. Will it last until February? Yes. Will it last until next Winter? Eh, probably not. Luckily, the coat’s price point is perfect for a transitional piece—nothing more, nothing less.